The Tamils may be justly proud of the fact that Tamil has won the status of a Classical language, the status it richly deserves and should have got long, long ago. The Central Institute of Classical Tamil (CICT), established in Chennai, has mapped out various plans including preparation of definitive editions of forty-one Classical Tamil texts and translation of these works into English and other major European languages as well as into major Indian languages and writing of a historical grammar of Tamil. Language being the autobiography of a people, our objective is to preserve and safeguard the invaluable treasure of the literary compositions in our language. If only we could delve into our past and recover the riches and wealth of the mighty treasure trove of Classical Tamil poetry, we will be amply rewarded by its lofty poetry, the poetry that strengthens and purifies the holiness of heart's affection and enlarges our imagination. Apart from these, reading the ancient Tamil texts such as Tolkappiyam, Ettuuokai, Pattuppattu, Tirukkural etc., provides a foundation for scholarship for the present and in this sense they do provide enlightened education. It is heartening to write this foreword to the series of publications brought out by CICT, which I am sure, will do full justice to the masterpieces in Tamil without compromising on the quality of production. The Cankam corpus being a repository of our glorious culture, it behoves our present and future generations to study them and to convey their message and the vision of life embodied in them to the public at large. Let me, therefore, commend the series to the enlightened beings the world over. Nanmanikkatikai, a four gemmed ornament, one of the eighteen minor works, belonging to an era earlier than the T" century AD has now been translated and published as an edition comprising an authenticated version of the Tamil text in quartets (venpas) numbering 106, a transliteration of the Tamil text, a glossary of culture specific terms, an index of opening lines of verses and notes. The transliteration used for presenting the verses for the benefit of readers who are not native speakers of Tamil is in accordance with the system evolved for the Tamil Lexicon. Producing an edition containing verse and prose translations is a unique feature of the project designed and executed by the team of CICT with systematic planning, meticulous care by the work's editor ably guided by the project coordinator. The editor's note focuses the readers' attention on the salient features of the work critically evaluating the text and its thought content referring to the stylistic and linguistic innovations and aesthetic merits relating to the work. I would like to place on record my sense of appreciation for the efforts taken in making the work highly meritorious by the provision of a useful glossary and critical notes that can be found at the close of the work inviting the readers' attention to culturally specific facts as well as stylistic features of the work which would facilitate an easier reading and interpretation of the text by speakers of Tamil as the first or the second or as a foreign language. The translations in verse compiled and made for presentation in this work involves a judicious selection performed with meticulous care and devotion and deployment of critical acumen that are the merits of the team involved in bringing out the work. A special mention must be made about the prose translations presented in this work. They are made by Nalladi R. Balakrishna Mudaliar, an educationist and an erudite scholar belonging to the second part of the twentieth century and his prose versions presented in the work are known for felicity of expression achieved by the choice use of words and structures. Special care is bestowed in preserving in this work the secular outlook which is the hallmark of classical Tamil literature. 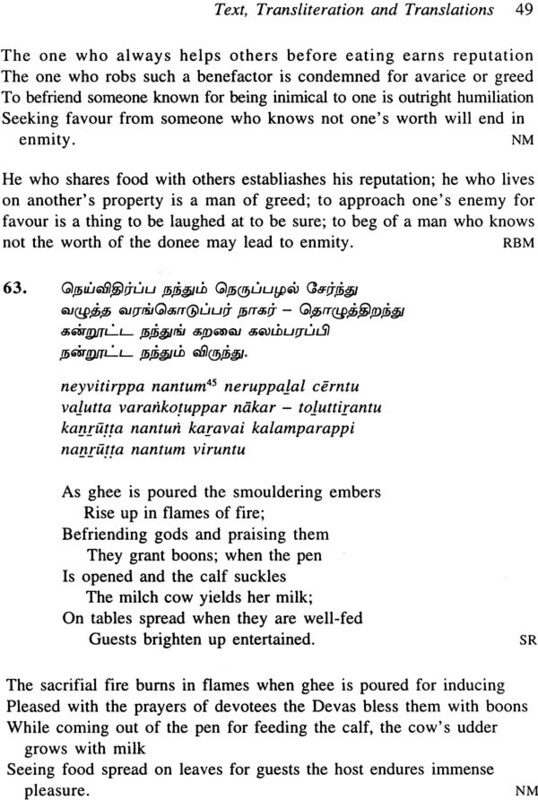 Though this work is placed at an era that marks the beginning of post-cankam classical Tamil literature, it retains all the qualities such as verbal compression, felicity of expression, gender neutrality, secular outlook, universal appeal, etc., of classical Tamil literature. The translators, the editor and the project team have taken every effort to present the thought contents and mode of the verses by pursuing a policy of fidelity and preservation of functionalism relating to the source language text. The fact that the work contains verse translations of eminent scholars such as G.U. Pope, Kamil V. Zvelebil, M.S. Pumalingam Pillai, etc., enhances its relevance and value. I am thankful to the Department of Translations of the Institute and the Publication Division for their efforts in coordinating the work leading to the publication of this attractive volume. The Hon'ble Chief Minister of Tamil Nadu who evinces a keen interest in publications of this kind has extended his support and patronage with an inspiring foreword for this volume. I would like to bestow my heart- felt thanks to him. It is my pleasure and bounden duty to congratulate the editor, N. Murugaiyan, the project coordinators K. Ramasamy, Officer-in- charge, and P. Marudanayagam, Fellow of the CICT on bringing the project to a successful completion and to commend the work to students, researchers and lovers of Tamil studies and to posterity.